Colored Diamonds or Fancies are diamonds whose colors like, pink, blue, black, orange or purple can either be very easy to find or extremely hard to find in their pure color, which makes them very rare and expensive$. The Pink Diamond is the favorite of women everywhere, because it is the color of softness and delicacy. Every pink gemstone is accompanied by a GIA Colored Diamond Grading Report to insure the highest grading standards on these and other rare beautiful diamonds. This gem is so extremely rare, they can be quite expensive. They are available in many desired shapes and settings. The gemstone is simply unbeatable. It adds its own charm and elegance to its wearer. The trilliant pink gemstone is bezel set above a softly rounded platinum band. The gemstone is paler with a tint of pink in it than the pink sapphire. And this gem is VS in clarity. VS meaning, Very Slightly, with inclusions clearly visible under a 10x magnification but they're minor. 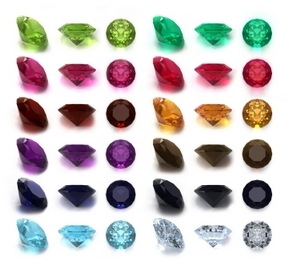 A gem is graded according to the intensity of color in each individual stone. It is a natural gem that has been color enhanced. 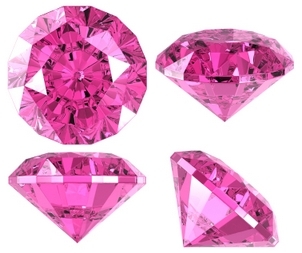 The original process used to create a pink gemstone is called painting. This gemstone is the most popular amongst the diamond experts. It is the ultimate symbol of femininity, love, and grace. The exotic and rare diamond is mined in Argyle making a tour a must. It is also found in mines in South Africa, Brazil and Australia. Because the real gemstone is extremely rare, it can cost from $100,000 to well into the millions, making it a highly prized diamond. Blue Diamonds--The Hope Diamond was cut from a larger stone known as the French Blue. This larger stone was once part of the crown jewels of France. It disappeared during the French Revolution in 1792. The blue diamond is rare and hard to find. 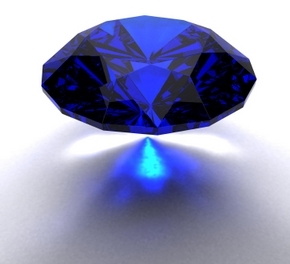 Boron is the element that makes the diamond blue. Blue colored diamonds are nature's rare reflection of the sky and the sea. These blue stones are originally from the Cullinan mine near Pretoria, the world's only notable blue diamond producing mine. The largest blue diamond produced in the Cullinan is the brilliant vivid blue Heart of Eternity, 27-carats. This diamond is part of the DeBeers Millennium Jewels collection. Perhaps, the most well-known blue diamond today is the "Le Coeur de la Mer"---Heart of the Ocean. In the blockbuster film, "Titanic" directed by James Cameron, the Heart of the Ocean belonged to Rose. The love affair between Rose and Jack emerges when he sketches her portrait with the brilliant heart shaped blue diamond necklace around her neck. As a tribute to her first love Jack, the elderly Rose slowly removes the much sought-after blue diamond from her coat and throws it into the ocean years later. Actress Gloria Stewart who played the elderly Rose in the "Titanic", wore a $20 million, 15-carat blue diamond necklace by Harry Winston to the Academy Awards in 1998. She was accompanied by a team of bodyguards to safeguard the necklace. Mythological tales tell of a blue diamond once set in the eye of a temple in Benghazi. It is known in older gem literature as "rosy blue", because the Golconda stone possesses a distinct delicate blue color. This polished 70-carat Idol's Eye is the largest publicly known blue diamond. The diamond was sold to Mrs. May Stanton, an American aristocrat, after World War II. Black Diamonds--Since the famous Black Orlov diamond, black diamonds have become much appreciated in fashions. The complete light absorption and the play of light retained in the depths of this natural black diamond is hypnotic and very unique. The black diamond is known as the Carbonado, a naturally polycrystalline diamond found in alluvial deposits in the Central African Republic and Brazil. Its natural color is dark grey or black and it is more porous than any other diamond. These alluvial deposits found in the two countries are not associated with kimberlite, the source of typical gemstones. These colored diamonds are found in younger sedimentary rocks. The crystallization of the carbonado is about 3 billion years old, as documented by lead isotope analyses. They are typically pea-sized or larger porous aggregates of many tiny crystals. Some carbonados contain inclusions of minerals characteristic of the Earth's crust. According to isotope studies, the carbon isotope value is very low (little carbon-13 compared to carbon-12, relative to typical diamonds). The Carbonados exhibits strong luminescence, light produced by, the induction of nitrogen and vacancies existing in the crystal lattice. You can invest in black diamonds, some are rare and certified stones. They are rare, therefore, very expensive. You can also purchase lab created black diamonds at a fraction of the cost from quality jewelry stores. It is believed that the black diamond was created as a result of meteors striking the earth. Black diamonds can be made into any type of jewelry and can be paired with any gemstone. There are five famous black diamonds in the world, with the fifth largest facetted diamond called, the Spirit of de Grisogono. It is a 312.24-carat diamond mounted in white gold and set with 702 (36.69 carats) colorless diamonds. And as stated above, the most famous black diamond is the Black Orlov which is legendary. Green Diamonds--This diamond's green hue is the result of natural irradiation. So, the natural green diamond is exceptionally rare and valuable. Irradiation is when radioactive water percolates through the kimberlite pipes or lamproite formations around the formed diamonds for millions of years. You are most likely to find yellow-green or green-yellow diamonds in the market at affordable prices, than find a natural green diamond, which only appears in the market in any given year. A beautiful green diamond was found in 1722, in India and given to King George I by Marcus Moses. This emerald is the largest and incredibly rare fancy colored diamond weighing 41-carats and is cut in a pear shape known as the Dresden, named after the capital of Saxony, Germany where it has been on display for the last two centuries. After World War II, the Dresden was temporarily displayed in the Soviet Union until 1958, then in the Smithsonian Museum in Washington, DC, USA in 2000 where it is now displayed in the same room with the Hope Diamond. Lab-produced green diamonds are being created and are compared to the natural green diamond to get the lab-produced stones as close to the real diamond as possible. Red Diamonds--These colored diamonds are extremely rare to find, therefore, very expensive and valuable. This diamond comes as a pure red, crimson, vermillion, or scarlet. The pure red stones are produced in the Argyle Mine in Australia in small numbers. There are only three very rare, large and famous red colored diamonds in existence. The Kazanjian Red discovered in South African, 1927 is currently on display at the Natural History Museum in Los Angeles, CA, until February 1, 2009, according to museum officials. It is one of the famous red diamonds and is on exhibition for the first time in America. The Kazanjian Red was stolen during World War II and recovered by American soldiers later. The diamond was purchased by a collector and remain hidden until the Los Angeles-based Kazanjian Bros. Inc. bought it in 2007. The second famous rare red diamond is called the Hancock Red Diamond. Even though, it is not displayed at the Natural History Museum in Los Angeles, it was sold at an auction in the late 1980's for $880,000 weighing only 0.95-carats. Brown Diamonds--The brown colored diamonds are less expensive than the other diamonds on the market due to lack of interest or attraction to them. They are produced in the Argyle Mine in Australia in large quantities. They are graded by tone from dark to light brown the same way as the other diamonds. They are marketed with descriptive names as "champagne" and "cognac", with anticipation and excitement of increasing the consumer's interest in these gemstones. Some people now find these diamonds to be the new classic gemstones due to Argyle Mines successful marketing. Their common shades are: Very light brown (champagne), Medium brown (champagne), Brown (dark champagne), Dark Brown (fancy cognac). The Argyle Mines in Australia devised a color scale to use for grading these diamonds from C1---C7 grades to separate them from their light to darker tonal ranges. Brown diamonds are also found in Africa and Siberia. Argyle Mines in western Australia are the world's largest producers of these stones. The most famous of the brown diamonds is the Golden Jubilee, the world's largest natural cut dark rich champagne diamond, which possesses a magnificence and mystery to it. It is a 545-carat stone that was offered to the King of Thailand to celebrate the 50th anniversary of his ascension to the throne. It took less than three years to polish the diamond. At the 2004 Academy Awards, on the red carpet, the brown diamonds were all the raves when Maria Menounos, E! reporter and Entertainment Tonight's dazzling host, wore her sensational champagne diamond dress, created by haute designer Randi Rahm, embroidered with 2,000 brown diamonds totaling 3,000 carats and worth a staggering $2.5 million! She accented her brown diamond dress with a splendid 6 carat cognac diamond pendant. Actress Cameron Diaz wore a 20 carat cognac-colored diamond with a Prada dress and actress Jennifer Love-Hewitt flaunted a 7 carat brown diamond ring at the Oscars. Japan's favorite movie star, Mari Natsuki swears by her brown rocks. These beautiful classic and unique brown diamonds are the latest must-haves. The Yellow Diamond was originally founded primarily in South Africa. Many of these yellow colored diamonds from light to vivid yellow are also found in several different countries. Some of the most notably famous yellow colored diamonds found in South Africa are the: The Red Cross and The Allnatt. The Red Cross is the largest known canary diamond presented to Christies on behalf of the British Red Cross Society. The diamond has a rare feature, which consists of, a Maltese Cross clearly visible in its top facet. The Allnatt is a 100-carat fancy vivid canary yellow. The Incomparable, a deep brownish yellow, is the third largest yellow diamond. It weighs 407.48 carats and is the largest internally flawless diamond in the world. Discovered by a young girl playing in a pile of rubble in Mbuji Mayi, Democratic Republic of Congo, the Incomparable is a record breaker. Yellow diamonds get their color from nitrogen, which causes the yellowish tint in the stones. In Africa the Eureka, pale yellow diamond weighing 10.7 carats discovered by the child of a Boer farmer in 1866, was the first diamond ever to be authenticated. There are several fans of the yellow colored diamonds, on the red carpet at the Academy Awards, actress, comedian Whoopi Goldberg wore a $5 million canary yellow diamond pendant weighing 80 carats. Actress Julianne Moore wore a 7.52 carat fancy vivid yellow diamond. Fashion supermodel Christy Turlington set her cushion-shaped yellow in a navel ring. Donatella Versace, designer showed off her yellow diamonds as well. In 1993 and 1997, Hiliary Clinton, the former First Lady, wore her 4.25 carat "Kahn Canary" flawless diamond to the former President Bill Clinton's Inaugural Ball and other important events. She wore the diamond to represent the state of Arkansas. The "Kahn Canary" was originally discovered at the Crater of Diamonds State Park in Arkansas, 1977. The diamonds belongs to Stan Kahn of Pine Bluff, Arkansas. He loaned the diamond to Mrs. Clinton. As history goes, the Medicis, one of the most powerful families of Europe owned the Florentine, a light yellow with a slight green undertone diamond, weighing 140 carats in the rough. In 1743, the Emperor Francis I wore the Florentine in his crown at his coronation. In 1918, the Habsburg Empire collapse and the Florentine diamond accompanied the royal family into exile in Switzerland, later the stone vanished, its whereabouts is still unknown. Orange and Purple diamonds are very rare and extremely hard to find in their pure color. The purple colored diamond is looked upon as a violet, a secondary color. The orange colored diamond is usually tinted with brown or yellow colors. Collectors have yet to find orange or purple colored diamonds in their pure colors.